To say I’m exhausted after the fashion extravaganza of the Oscars weekend would be putting it mildly. 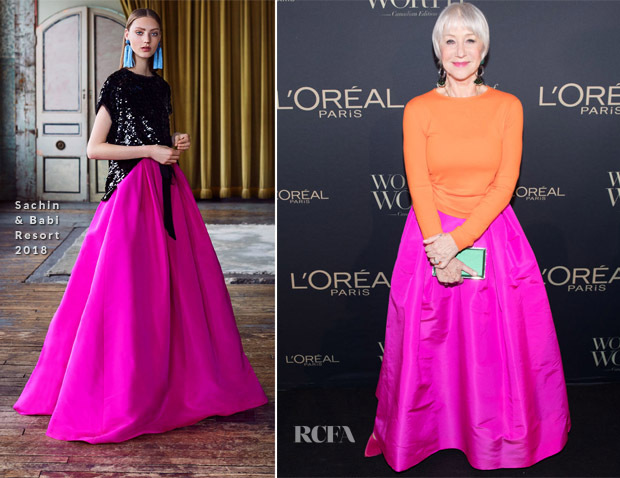 I was just about to start on the best dressed poll to close the week when I saw Dame Helen Mirren. The British actress attended the L’Oreal Paris Canadian Women of Worth Awards on Thursday (March 8) in Toronto, Canada, in celebration of International Women’s Day. The colours, oh the colours, of this Escada and Sachin & Babi look hit me like I was having a vitamin B12 shot – as a result, I’m fully awake. I love how the look appears informal until, then the skirt gives this outfit a modern fairytale ending. Styled with a Judith Leiber clutch, hot pink Michael Kors shoes and ‘Malachite Deco’ statement earrings by Tory Burch, this is the grand dame at her very best.